Do we need Mars Mission? Old article, just updating a few bits after Mangalyaan reached Mars in September 2014. There is no dearth of ball by ball commentary and technical articles in newspaper, but for the exam focus should be on: basics, purpose, pros and cons. Otherwise September seems to be the busiest and tiresome month of 2014 for competitive aspirants- Modi Government launching a new scheme-committee-initiative every day, SC giving a new landmark verdict every day, newspapers are littered with columns on foreign relations, Ebola, Mars, ISIS, J&K floods, Scotland and what not. 2nd smallest planet in the Solar system after Mercury. Volume wise, ~8 Mars would fit inside our Earth. Mars is also tilted on its axis (25 degrees). Mars gravity 1/10th of Earth. When Sun and Mars are in opposite direction, it can be easily observed from Earth. 56 million kms 400 million kms, when both are on opposite sides of solar system. reached Mars on 24th Sep 2014 Reached Mars on 21st Sep 2014.
launched from Sriharikota, Andhra launched from Cape Canaveral in Florida, US. Surface/geology: using camera and spectrometer. Only study Martian (upper) atmosphere. Will find the answer: Did Mars ever had suitable environment to support life? has five instruments/payloads has eight instrument- spectrograph, magnetometer, ion analyzer etc. – The spacecraft may also provide communications relay support for future Mars landers and rovers. ISRO had used PSLV XL (C25) launch vehicle to launch the Mangalyaan (Mars spacecraft). Why? Mangalyaan weighs ~1300 kg. PSLV can easily carry this weight. PSLV is tried and tested technology. MoM/Mangalyaan: first Indian spacecraft to cross Earth’s escape velocity of 11.2 km per second. Mangalyaan traveled for ~300 days, covering ~65 crore kilometers, and reached Martian orbit in September 2014. Mangalyan is not the fastest spacecraft to reach Mars. Others are far ahead of It, in terms of speed. For example- European Space Agency’s Mars mission (2003) reached Mars in ~210 days. MoM cost 7 rupees per kms to reach Mars. time to finish one circle of Mars ~73 hours / ~ 3 days. Q. What is the purpose of sending MoM? 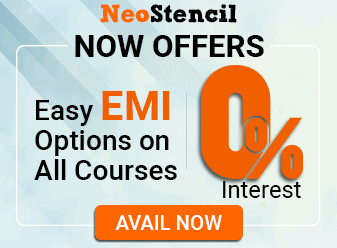 Study surface, dust storms etc. Take photos of Mar’s satellites: Phobos and Deimos. Mars Exospheric Neutral Composition Analyzer. To study neutral gas atoms in the Martian atmosphere. 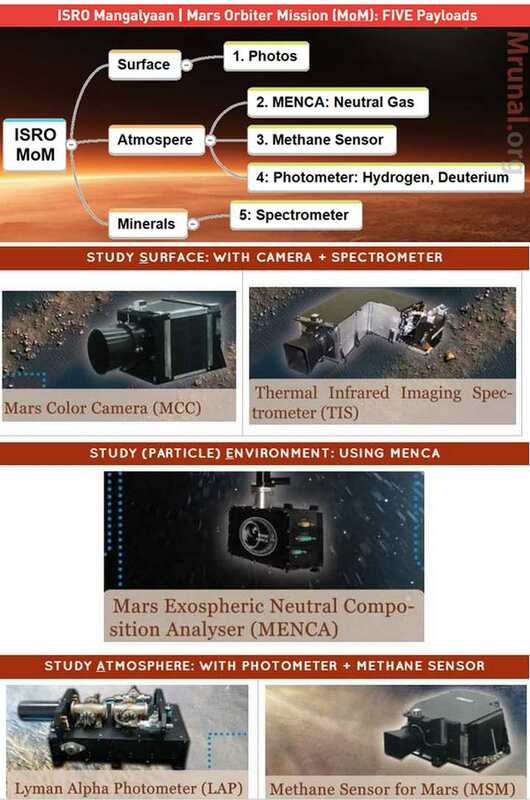 Methane Sensor for Mars (MSM). If methane + water detected=possible that at some point of time, Mars had supported life form. To Measure hydrogen and deuterium. Deuterium = heavier than hydrogen.Water made from heavy hydrogen is heavier and hence it evaporates differently. Knowing Hydrogen : Deuterium ratio will help answer how did water vanish from Mars? And to help UPSC update its Mains GS1 syllabus: Distribution of key natural resources across the Earth AND Mars. ISRO Telemetry, Tracking & Command Network @Banglore. Now doing the same for Mars orbiter. Crores of rupee wasted- could be used to feed millions of hungry people in India. Millions of children suffering from malnutrition, half the junta doesn’t have toilets- Modi himself highlighting this issue in his every speech. Better get those thousands of ISRO scientists and engineers to comeup with new technology to fix malnutrition and malnutrition. ISRO’s budget is better spent to meet India’s communication needs and bring down digital divide. Even Airtel has sued ISRO for not meeting its contract obligations. So, ISRO better focus on present rather than doing some mars research whose benefits can materialize may be after 100-200 years. ISRO has installed a fancy methane detector in this spacecraft. But NASA’s curiosity rover data has already concluded that Mars environment doesn’t contain methane. ISRO is only doing gaddha majoori (donkey labour). Counter argument: NASA’s Curiosity rover measured presence of methane in a small area. But ISRO will scan entire Martian environment to detect Methane. GSLV testing has not giving positive result yet. Had they waited for GSLV testing to finish- Mars Mission could be done in 2016. (Even Chandrayan-2 project is stalled due to this GSLV problem). But it seems ISRO chairman wants media publicity before retiring, so made he all the haste to launch Mars Mission in 2013 using PSLV (instead of GSLV). Less of a scientific pursuit and more of a space race with China- ‘me too’ going on Mars. First India should overtake China in terms of GDP and poverty removal. This is just publicity stunt to divert attention from real issues. Earlier Chandryaan found traces of water on Moon, then Aaj-tak etc. Hindi channels ran 24/7 reports for weeks. In the meantime government can go scot free with bigger scams and inflation. And most importantly, the youngsters have to mugup one more stupid topic for the competitive exams. The financial cost of combined man-hours wasted in studying such topics= alone worth 13% of GDP, so much for Demographic dividend. At the core of “Anti” arguments= Cash that ISRO has wasted in this Mars project. But in reality it’s an investment that will be recovered within a few decades, How? Many countries in Asia, Africa and Latin America are seeing good economic growth. But they lack skilled manpower, technology and budget to setup their own launch vehicles and premier space agencies. But they too need satellites for communication and military. So, they outsource the satellite launch/survey work to established players. ISRO’s commercial Arm ANTRIX makes annual profit of ~100 crore rupees from such ‘outsourced’ contracts. ISRO spent only 450 crore rupees. NASA has spent billions of dollars on Mars. This Makes ISRO world-famous as a prudent cost saving space agency= more clients via its commercial arm ANTRIX = more money incoming. So, we can see this Mars mission as ISRO’s 450 crore rupees advertisement / PR campaign- to impress those potential ‘clients’ and get more contracts=> money will be recovered and profit will be made. As ISRO establishes reputation, gets more contracts from third world- it can be used as a tool to exercise soft power. How? Oil-gas exploration contracts in their territory …and so on. Government spends barely ~0.35% of budget on space programs. And even out of that ~0.35% allocation, ISRO spent only 8% on Mars Missions. There are plenty of government schemes with way bigger budgetary allotments for poor people. So it’s not like government stopped/reduced expenditure on some xyz scheme for poors to fund ISRO’s Mars adventure. Agreed, poverty should be removed, and everyone must get food security. But the proposed food security bill will need ~1-2 lakh crores rupees every year. Even If ISRO didn’t spend 450 crores on Mars, the money thus saved- won’t make a big contribution to food security anyways. And ISRO became the fourth one. Even USA, Japan and China failed to reach mars in their first attempt. Overall, 51 missions made so far, only 21 have succeeded. ISRO’s Mars mission succeeded in its first attempt (that too without coaching), hence it’s a milestone in the history of space explorations. Even China has applauded this event as “pride of Asia”. Will attract talented desi scientist/engineers to join ISRO. Thus, braindrain will decline. Data gathered from ISRO’s mission, can be used to send manned mission (astronauts) on Mars later, with collaboration of NASA etc. The technology used in this mission has potential application in weather forecast, computer tech, health-medicine etc. in future. Humanity would not have progressed, if we had not taken such leaps into the unknown. And space is indeed the biggest unknown out there. Q2. Which of the following missions have failed to reach Mars? Q3. Why did ISRO’s Mangalyaan or MoM used PSLV instead of GSLV as launch vehicle? PSLV could carry MoM’s weight and had proven track record of success. Q4. Similarities between ISRO’s MoM and NASA’s MAVEN missions? Both were launched and reached Mars in the same months. Q5. What’s the purpose of ISRO’s Mars mission? Discuss the importance of ISRO’s MoM Mission as a milestone event in the space exploration programs of India. 200 words. Write an Essay: The hunger of exploration and the thrill of discovery are not for the faint-hearted. A: 1 and 2 wrong. MENCA is for neutral gas, not Natural gas. Amazing article Mrunal…….I’ve never come across an article providing pros and cons of space exploration in such a brilliant manner!! The point on soft power and international clout was indeed great and kinda out of the box. KUDOS!!! An anti-argument: – The mars orbiter was build to carry total 7 instruments but at the time of launching only 5 was ready so in a haste to register its name ISRO sent the orbiter with only 5 instruments and waste lot of valuable space on orbiter. Can you provide me the list of antenna used in ISRO’s MOM.